Today, my friends, we’re headed to Disney World’s Polynesian Resort to visit one of my favorite places — and yours — ‘Ohana. 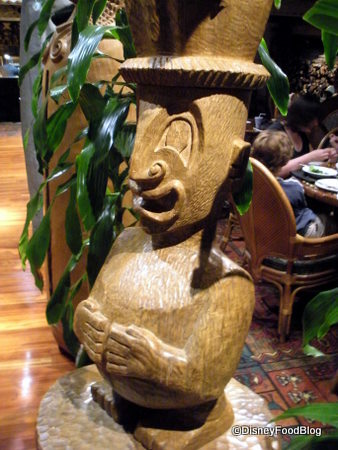 Those of you versed in Lilo and Stitch, or those of you who have been lucky enough to visit the beautiful islands of Hawai’i, know that “‘Ohana” means “Family,” and at this restaurant, they drive the point home. Food is served family style, everyone in the restaurant — including you — are “cousins,” and the Hawaiian entertainment is aimed at bringing everyone together to participate in common activities. It’s a restaurant like none other in the Disney realm, and its high points are what keeps ‘Ohana a tough reservation to get. Listen to the Islands: ‘Ohana often provides a very talented Hawaiian musician to play and sing live music in the waiting area outside of the restaurant. There’s no better way to relax into the island feeling than letting the sounds wash over you after a long day in the parks. Go Shopping! : Your buzzer will work throughout the second floor of the Polynesian Resort’s main building, so head over to the shops opposite ‘Ohana for a gander at the merch you don’t have time to see when you’re in the parks. OK, now that you’re relaxed and have a drink or a shopping bag (whatever your pleasure), your buzzer is buzzing and you’re headed into the restaurant. 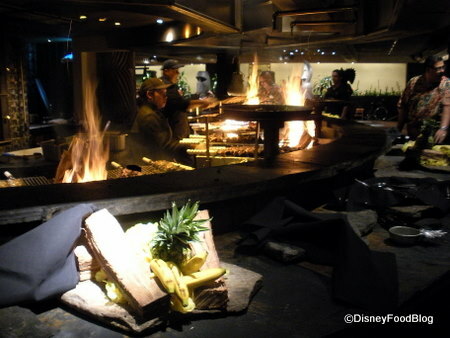 ‘Ohana is a large room wrapped around a massive fire pit, which is the origin of your food for the evening. The room is edged with nearly floor-to-ceiling windows with views of the Polynesian Resort grounds, Seven Seas Lagoon, and Magic Kingdom icons like Cinderella Castle and Big Thunder Mountain. ‘Ohana Tip: Consider booking a reservation for an hour before the Magic Kingdom Fireworks are scheduled. Request a window table, and prepare for an amazing show! ‘Ohana will pipe the music right into the restaurant! 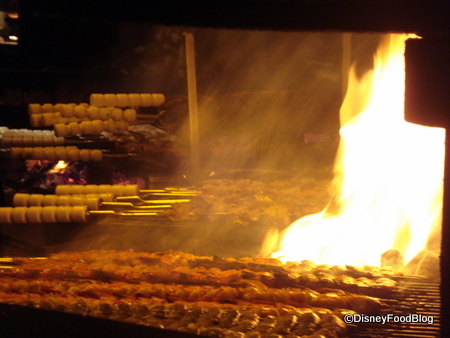 Your “cousin” host will take you on a tiny tour of the restaurant, passing by the open kitchen and an array of “sample drinks,” then by the open fire pit where Cast Members are grilling long skewers of meat and shrimp, and then on to your table. Once you’re seated in the large, cushy chairs, you’ll be greeted by your server for the evening. This is the person who will be taking care of drinks and other specifics. He’ll be joined by a second serving “assistant,” who will likely be bringing most of your food. Another cast member you’ll be acquainted with by the end of the evening is the Hawaiian cultural ambassador and “entertainment director.” This individual is in charge of passing out leis, teaching hula lessons, serenading honeymoon and anniversary couples through a romantic slow dance, leading the restaurant in Hawaiian renditions of “Happy Birthday,” and emceeing coconut races and hula hoop contests for the kids. As you’d imagine, she’s very busy, but you’re sure to have as interactive — or as relaxed — an evening as you wish. 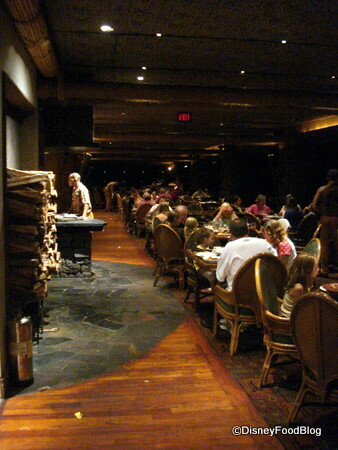 ‘Ohana Tip: Personally, I love making reservations for 5pm, when the restaurant opens. I request a window table, order a Hawaiian drink, and watch the sky over the Magic Kingdom change from blue to pink to orange to red as the sun sets behind the Grand Floridian. There’s nothing more relaxing, as far as I’m concerned. Now, even though you’re seated and have met your servers, there actually won’t be much ordering; ‘Ohana offers a set menu. For those who have dietary restrictions, likes, or dislikes, however, be sure to bring these up to your server. 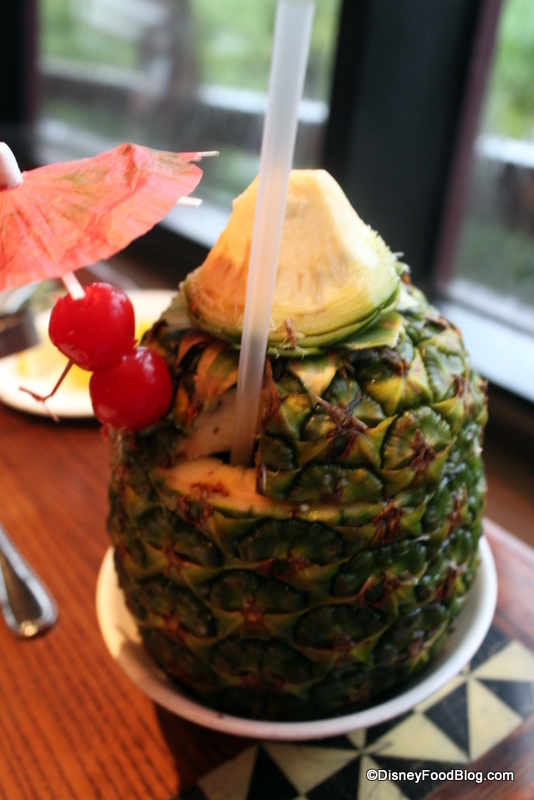 ‘Ohana is famously good with ensuring everyone at the table has food that fits their needs. The meal at ‘Ohana includes plates and bowls full of Polynesian-inspired dishes. It begins with a delicious freshly-baked pineapple bread, dubbed “‘Ohana Welcome Bread,” which is brought to your table by the “cousin” who seats you. Be sure not to fill up on this, though — there’s MUCH to come! Next up, one of your cousins will bring you Mixed Greens with honey-lime dressing. 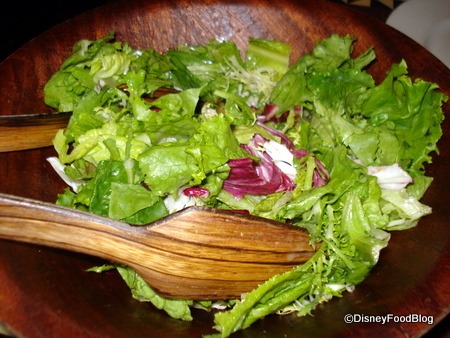 Many speak of this dressing with sheer reverence, and it’s an oft-requested Disney recipe! 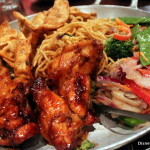 Just as you’ve dug into your salad, large plates of lo mein noodles with vegetables and teriyaki sauce, stir-fried vegetables (usually mostly broccoli), pork dumplings drizzled with a sweet and sour sauce, and honey-coriander chicken wings show up on your table. 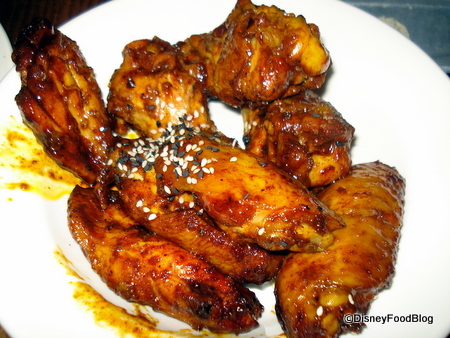 These are some of the best chicken wings on Disney property (true…there aren’t many chicken wings on Disney property, but these are still pretty good). Finally, your cousins come by with the main event — grilled meats stacked high on skewers. This is a show in and of itself! One meat will come to your table at a time: mesquite grilled turkey, asian BBQ pork loin, marinated sirloin steak, and spicy peel n eat shrimp. (Note: these are on the menu at “press time;” Disney switches these up often.) The meats are accompanied by three sauces: peanut, spicy mustard, and sweet n sour. Your server will recommend which sauce to try with which meat. And lastly, but, in my opinion, most importantly, the dessert. 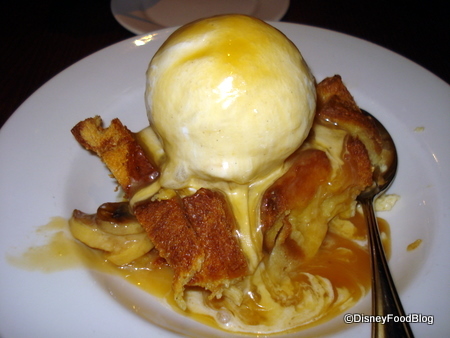 If you don’t save room for this, you haven’t gotten even half of your money’s worth at ‘Ohana: ‘Ohana bread pudding a la mode with bananas foster sauce. How It’s Being Served: Perhaps you’ve had a different experience, but for the past several visits, the ‘Ohana meats seem as though they’ve been sitting on the fire a bit too long. The meat has been exceedingly dry and much too well-done. I understand the concern about undercooked meat, but there’s a happy medium that many other Disney restaurants have found. 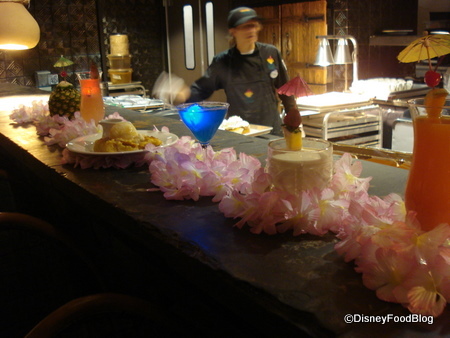 And, of course, I’d chalk this up to a fluke if this had been my experience only once, but I’ve now had several visits where this has been the case.While I keep going back to ‘Ohana for the drinks and the dessert, I regret to say that the meal itself has lost much of what made it desirable. Your last two points are the reasons that we’ve never eaten there, and may never eat there. We’ve just heard waaaaaay too much in the way of negative reviews regarding the food and service to have much of a desire to waste our precious WDW dining time and dollars at the place. Add to that the fact that we’ve dined before in a few different local churrascarias, where the meats and sides were *MUCH* more plentiful than what’s on offer here, and were *still* not all that impressed (what can I say? I like my meat more on the rare, tender side), and, well, a trip to ‘Ohana just doesn’t seem to be in the cards for us anytime soon. Great review. I love the site, though it always makes me hungry 😛 I just started a vegetarian diet, but I still love looking at all the pictures of meat! I am glad to know that ‘Ohana is good at accommodating food restrictions. Just a small note, as someone who is Hawaiian and hails from Hawai’i you do not need the ‘okina (the apostrophe like thing) in the word Hawaiian. Hawai’i is a Hawaiian word, whereas Hawaiian is not. 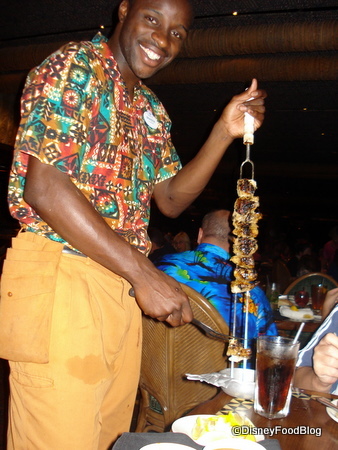 Also, I forgot to add, the last time I went to Disney World in 2007 (when I ate meat) ‘Ohana was one of my favorite meals! 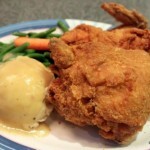 I loved the wings, scalloped potatoes, turkey, and especially the bread pudding! I liked it better without the sauce – it was just so creamy and custardy. Yum. I am sad that they no longer have the scalloped potatoes. Those were really good too. While I agree with you about the meat being overcooked (and I do miss those scalloped potatoes! ), we still make time to return to ‘Ohana each time we are in Disneyworld. In our opinion, the fun atmosphere and beautiful view is kind of a “tradeoff” for the sometimes average food. 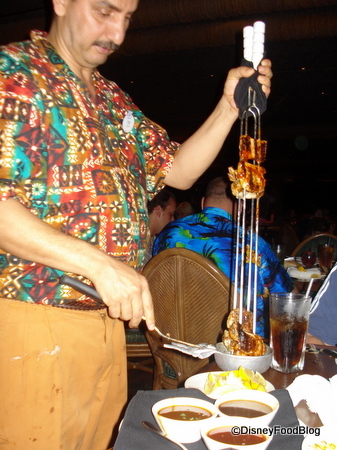 I do love the Lapu Lapu, and those chicken wings make it worth coming every time! I have only eaten there once, but pretty much agree with both of your points, the variety and quality of the food seems lacking. As someone who enjoys steak tartare, the meats were incredibly overcooked to me, and using sauce to provide flavor is a cheat. I did enjoy the noodles, dumplings, and, most importantly, the Lapu Lapu though. Great posts. I agree with you 100%. I love going to Ohana even though the food isnt great. The dessert, wings, and atmosphere will keep me coming back. Another way to get almost the same experience and some better eats is Kona Cafe. I have had some delicious meals there and its much easier to get a reservation. The tuna oscar is fantastic. Jeff — I can definitely sympathize with that. While dinner at ‘Ohana used to be an “every trip” experience for us, the food choices and quality have moved the restaurant onto our “every once in a while” list. We still love the atmosphere, the view, and the dessert, but it’s not worth the money to go more often. Anderson — THANK YOU! I realized the ‘okina problem last night and though I’d taken them all out, but I guess I was up to late and not paying attention. I’ve taken them out now. Where are you from, originally? Also, Disneyland in 3 weeks!! I can’t wait!! Rich — Agreed on the sauce point. 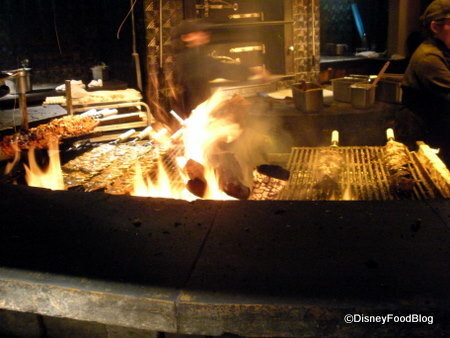 There are so many good steaks in WDW that eating a bad one seems to be an unnecessary waste of time and money. 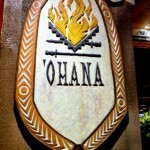 Maybe we had an exceptional experience, but Ohana was my favorite meal last trip, just slightly better than Teppan Edo. The food at Teppan Edo probably was a bit better and the atmosphere was pretty good, but the way Teppan Edo handles kids dessert on DDP still aggravates me (and this was last September). Anyway, the pork at Ohana was especially good, and they brought my daughter non-spicy shrimp since she’s not a spicy food eater (yet). Those chicken wings were also great, and of course the bread pudding. I’ve been thinking about trying my hand at making the bread pudding at home it was so good. The concept sounds really interesting, but as a solo traveler and a light eater, I just haven’t been able to bring myself to try this place. Perhaps, over time, if I hear that the quality of the food has gone up…Seems like it would be a fun place for a group dinner, though. If Ohana’s is so accommodating, why can’t they accommodate my desire for a medium rare piece of steak? Has anyone ever asked for less well done meat? I have only been to Ohana’s once, last October, and was displeased with the overcooked meat. I haven’t crossed Ohana’s off my future restaurants list, but it’s closer to the bottom than the top. We have reservations for Kona Cafe for this May. Looking forward to trying it out. Scott — This is an EXCELLENT point. I would bet good money that if you asked your server for the meats to be done slightly more rare, they’d be able to do that for you. Brilliant. I’m trying that next time. Even though the food has went a little downhill over the years, Ohana is still a tradition for our family. I do not miss the potatoes. 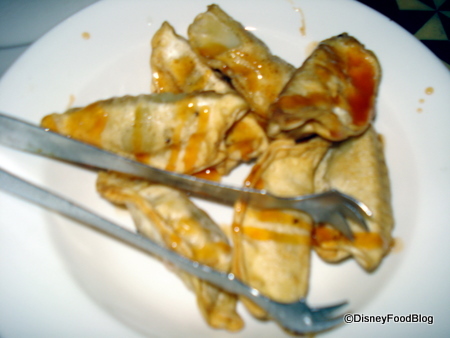 What I miss arethe wontons Ohana used to serve 8-10 years ago. Those were the best!!! I also miss the light dessert of pineapple with caramel sauce. I find the bread pudding too heavy. Everytime the menu changes, I have high hopes of a wonton return. I’ll keep hoping. Ohana has always been on our list too…not for our upcoming trip though. The atmosphere is great (especially for those fireworks) and I just love visiting the resort itself. 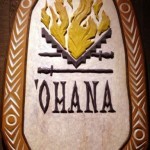 I was at Ohana for dinner a few weeks ago, and it was fantastic! My boyfriend thought it was one of the best meals he had ever had (mind you, we can’t afford fancy dining). The steak was medium rare and when you cut it open lots of bloody juices ran out (how we like it) and the pork was perfect as well, although the turkey was a little over-done. We could have had nothing but dumpling and been happy (YUM), the dessert is obviously delicious, and I REALLY like the noodles although I know a lot of people don’t. Also our server suggested trying some of the peanut dipping sauce on our salad, and once we did we devoured it in seconds! My boyfriend is NOT a salad eater and he still talks about it! One thing we could have done without was the entertainment. We had the lady and I wasn’t a huge fan- I thought she was annoying if anything. When I went a few years ago we had a man and he was much better. However, this time we were right at the window for Wishes, which MORE than made up for it! Hi AJ! After reading this post this morning I just called to make a reservation at Ohana for the weekend of the Wine & Dine Half, and would you believe they were completely booked up already (it’s exactly 6 mo out) for a party of 2 for both Friday and Sunday that weekend?! I haven’t really done a whole lot of research on how common of a phenomenon that is, but I’m curious– do you know if they open up more slots closer to the date or if there’s another way to work the system? I’m worried now that we’re going to get shut out of everywhere I try to reserve, you know? Thanks! Maria — Isn’t visiting the Polynesian just divine?! How do you like the ‘Ohana breakfast? Reviews are always glowing! Angela — I’m so glad you had a wonderful evening and meal!! Yep ‘Ohana can be completely enchanting, can’t it? Really does depend on your personal taste whether or not you like the entertainment, though; I think the gentleman who used to be in the restaurant is doing some entertaining in the lobby area now 🙂 I think he’s great. AJ – Good review, I couldn’t agree more. I’ve never cared for the meat, especially the turkey (if they still do that). Turkey really wasn’t meant to be cooked on a spit (other than whole) in my opinion as it is, of its very nature, a “dry” meat. 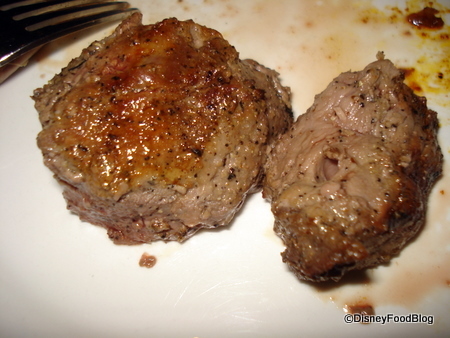 Also, there is a certain amount of seasoning that should be added as the meat is cooking – I realize that not everyone agrees on seasonings, but a little would help as the meat is too dry to accept seasoning once it arrives at the table. The salad, well the salad DRESSING, is remarkable. For those who get the recipe and make it at home, don’t make it ahead and don’t let the dressing touch the greens any sooner than absolutely necessary! The dessert is also remarkable although I like it better without the bananas (which ‘Ohana has always fully accommodated). 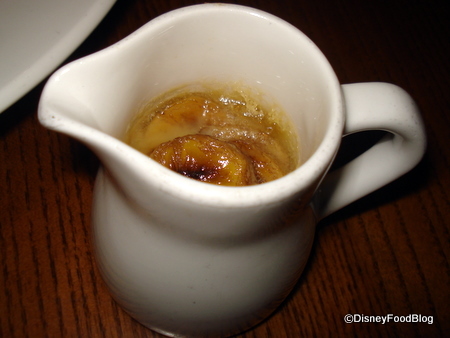 You can make the bread pudding and bananas foster at home using the ‘Ohana recipe but I’m sure they use farrrrrrrrrrrr less rum at ‘Ohana than their recipe calls for. Beware!!! In its defense, ‘Ohana IS a very friendly place with fantastic atmosphere. It is one of those places where letting your celebration be known will ASSURE some special treatment. Oh, and I’m sorry about the potatoes – must be they weren’t in the budget. Hey AJ. I’m so excited for you to go to Disneyland! I am going there sometime in May again, and I can’t wait. I’m from ‘Aiea on O’ahu, but am in Arizona for school. I’m impressed that you use the ‘okina. I am super excited about the new DVC resort opening and will definitely find time to eat at the restaurant once it opens. Are you from Hawai’i? fjfuchs — I think the potatoes were thrown out because of a general (and incomprehensible) anti-trans-fats sentiment that’s been going around lately… . Thanks for the tips on the salad dressing and the bread pudding! Agreed on the rum! Anderson — I’m pretty excited, too! I’ll have to do a lot of eating, but I have faith! Also, I’m not at all from Hawai’i, but I just spent 3 weeks on Kaua’i in November and fell in love with the island. We can’t wait to go and explore more! Where did you find the Sunday night rez? Amy — Good point! It’s because Disney lets people with resort reservations book restaurant ADRs for 10 days into their stay once the their reservation start date hits the 180 day mark. ‘Tis confusing; I sent you an email with more info. Of note, I did actually ask for rarer meat and was not accommodated. 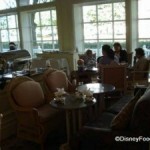 However, I have noticed that service in Disney restaurants is either divine or Applebee’s-style. The server I had that night seemed to fall into the latter category. We were really excited for our first trip to ‘Ohana back in January. We left rather disappointed. Our meat, as many others have said, was very dry. It also wasn’t particularly warm. The noodle dish was sub-par and forgettable. The broccoli was of the worst frozen variety. Our bread was lukewarm and served without butter which seemed odd for a bread course. We really liked the salad and wings, but our potstickers were a little dry and lukewarm. The bread pudding was divine, but we typically don’t order dessert out, so it isn’t a priority for us. Our server was MIA for most of the dinner, and it took at least 10 minutes to get the dessert. There is a lot of hype concerning this restaurant on the web, so it was interesting to stumble upon this page and find many people with the same experience as ours. Hopefully, it improves. The setting is lovely. We don’t really hit up Ohana anymore because we don’t like making reservations that much in advance. For our meat fill, we usually end up making reservations at a place like Texas de Brazil to get a churrascaria experience. Rich — That’s unfortunate that you weren’t accommodated. Agreed that the service at ‘Ohana has been on the downturn, too. With two people serving your table, you’d think it would be easier to provide excellent service. Louise — Yes, sadly for me ‘Ohana (for dinner!) falls into the group of restaurants that cycle through good years and bad years. ‘Ohana used to be a positive experience with great food and good service; lately it’s been slipping. I’m hoping the upswing will come soon. Amy, I feel your pain. I just made ADRs for the Food & Wine marathon weekend and Le Cellier was booked solid within 38 minutes of people being able to make reservations. I’m betting some of this is in anticipation of free dining coming out. I bet if it doesn’t, some of these might open up. AJ: I’m going to try this when I go with the family in December. It looks amazing. I had no idea. Chris — Keep me updated on your review. Great review! 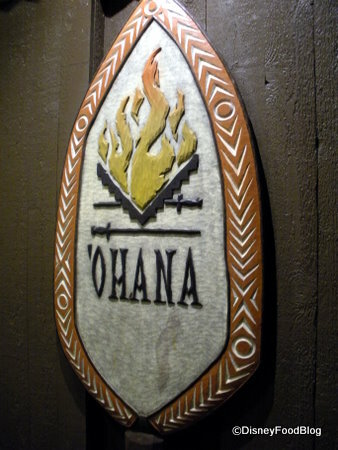 haven’t been to ‘Ohana for dinner yet, but it is tentatively booked for our arrival night this vacation. 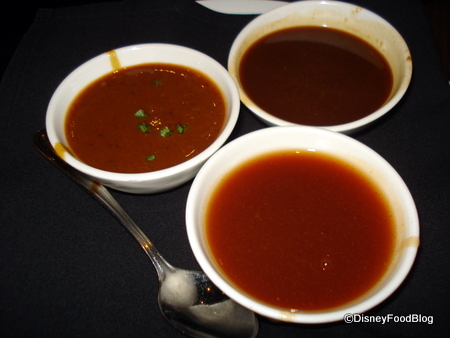 We are trying to decided between 3 dinners for 2 of our 7 nights of vacation…’Ohana, Chef Mickey’s and Whispering canyon. Do you know if ‘Ohana will accommodate picky children? I have 8 1/2 year old twins and a 6 year old and the 6 year old might try some of the foods there, but I don’t think there is much that the older ones will eat. They are not much into grilled foods. Does ‘Ohana offer any type of kids menu so us adults don’t have to miss out on it? First…I so miss the Maui potatoes! we enjoy ‘Ohana but the last few visits have been hit or miss. One time, the turkey was the best…the next time, it was the worst. As for the steak, ours has always been on the rare side (I can handle medium to medium rare). The problem for us is that my hubs likes his steak, well, burned. It has been difficult to get even medium well for him. Go figure! I also like how accommodating the servers are for my picky kid. I’ve never had a problem getting either chicken nuggets or a grilled cheese for him. Janna — So weird how different the experiences are. I just learned while taping the WDW Today Podcast last night that there’s a new head chef at ‘Ohana (TJ, from Boma, who I love) — I’m hoping he makes it all better. Is there anyway to email this review and comments to the new ‘Ohana chef? This information is exactly what a new chef would like to hear about his new restaurant. Scott — I’m not sure, actually! That’s a great point and a good idea. Kelly — ‘Ohana should accommodate your kiddos. 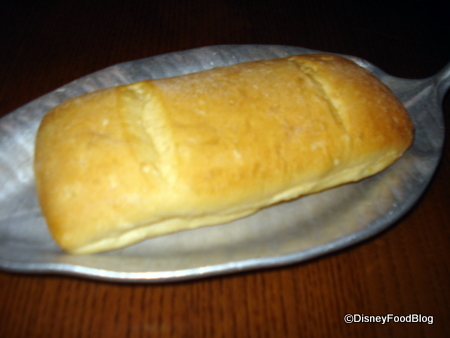 If you’re concerned, call 407-WDW-Dine and ask to speak to someone about special diets. They should have no problem setting up a call with someone at Disney who can make sure there will be food for your twins that night. 🙂 Let me know when you choose which two of the three you’re going to go with! After years of trying to score a reservation (nearly impossible on a weekend), we finally found ourselves back at ‘Ohana this past Friday night. My expectations were low because I had read so many bad reviews about how the place had gone down hill in recent years. Still though, I love the atmosphere and we recently took a Hawaiian vacation so aloha beckoned! We started at the bar where I had the Captain’s mai tai and Mike had some sort of mojito with mint that was very refreshing. After a short wait, our table was ready and I was thrilled when I saw we’d have a castle view! It was dusk so through the course of our dinner the castle lit up. You really can’t beat that! The food service was a little slow and plates were piling up on the edge of our table as we finished up the salad and the wings (delish!) and pushed aside the won tons (tasted like re-heated cardboard). 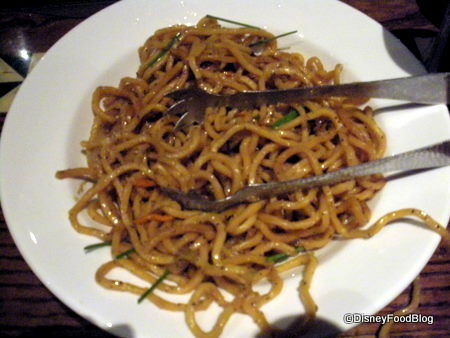 Next came the noodles, broccoli (which I feared would be mushy but thankfully it was crisp!) and dipping sauces. I started dipping the broccoli in the divine peanut sauce while we waited and waited for some meat to come around. The noodles were good but I knew they’re there to fill me up so I tried to avoid them! Finally, the steak arrived and – once again – I was pleasantly surprised by the taste. It was juicy and smoky and wonderful. After about 10 more minutes, shrimp skewers appeared and I asked for a lot fearing that it would be awhile before anything else came out again. The shrimp were so good that I didn’t even need to dip them in any sauces. Alas, I ate too much shrimp and had little room left for the chicken and pork that came next. The few bites I had were a little dry. Now I found myself hoping for a long pause before dessert appeared! When it did appear, nothing would have stopped me from eating it. It was that good! I was uncomfortable all night but it was worth it. ‘Ohana is definitely worth the money. I thought the food was great compared to some other places around the World (especially buffets) and the restaurant is just beautiful inside and outside with the stunning view. I may not be hungry enough to eat here again for another 5 years though! Would like to have the shrimp recipe, please? I’ve always enjoyed the food at Ohana. Once it was only average, but every other time I found it incredible. I even had our rehearsal dinner there! The wings are top-notch. I too miss the missing snap peas. I’m not a broccoli person at all. As good as the dessert is now, I miss the old dessert: simple sliced pineapple with a caramel dipping sauce. After eating all that meat, I like the refreshing fruit flavor rather than the heavy bread pudding. Completely agree. We tried O’hana for the first time this past June and won’t likely be returning. Our minusses – “entertainment” director and activities were far too loud and frequent (definitely disrupting); initial “appetizer dishes/veggies” not to our liking; dry meats; the most rushed service we’ve ever encountered on property (even near closing time);, but most of all the continuation of service during Wishes – our view was frequently disrupted with servers and skewers. I mean come on, the show is only 13 minutes and it’s the reason why people dine here; suspend service during the show! We dont like Ohana, we always have dry dry dry meat. I never have to go there again, after trying it 4 times, I think we have given it enough chances. Breakfast was fine, but for dinner I will head to Kona Cafe for some yummy sushi and a lapu lapu! Wow does this place now stink! In years past it was great. It is so bad I stopped eating and wrote this review. Interested. What a shame this place has become. Get a table close to the windows, forget it folks. Cousin stuff like the good old days. I’ve been to this restaurant twice (2008 and 2010) and we’ll be going back in 2012 as my father-in-law loves it. He also picks up the bill so I really shouldn’t complaint. Now, I think the food is very good but I don’t love the experience…mainly because it’s very rushed. Even with the tactic of saying no and asking for a bit of time we were still sat at our table for just 55 minutes at the last visit. We ate a lot and enjoyed it but that’s one heck of a rush. I also think the bread pudding is poor. My mum’s is roughly a million times nicer. DGF and I went back in October 2012 for my birthday, and we loved it. I guess people experiences differ are with the servers. Ours was great and attentive, though I would have liked the refills on my beer a little more timely. That was my sole complaint, and even then, I’m being picky. From the bread to the appetizers, to the main course, HalloWishes, and the divine bread pudding, it was excellent from beginning to end. The entertainer was really friendly, and was far from overwhelming. Meat and sauces we’re cooked perfectly, and the skewer-folk were subtle enough during the fireworks about offering more food. I liked it a lot, and plan on going back for our next trip! P.S. – I heard they’re going to be/already have changed up a couple of things. Might be time for a follow up trip, AJ! I was so looking forward to eating at O’hana. This meal was so disappointing. The salad had very little dressing on it. The wings and dumplings were cold. (Although I thought the dumplings were the best tasting part of this meal.) The noodles were too sweet. The meats were so dry we could barley swallow them. The desert was way too sweet with all that syrup. Although my husband thought it was good. The waiter asked how we liked the meal and I was too kind and said it was ok. He looked shocked and said, only ok? He asked if we would like to talk to the manager and I said no that was alright. This was our first and last time eating here! 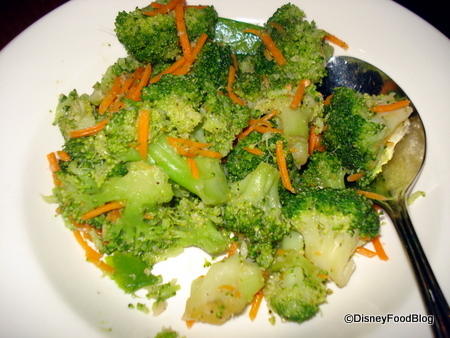 This was the worst meal we had at WDW. I love O’hanas! Love the food! It’s a disappointment when we can’t get reservations. We never had bad food, but we get there at the beginning of dinner hours. So for all the people that don’t like it, please don’t go so we can! As for people saying the meat is overcooked, we always have to ask for them to make well done. Any time you go anywhere and it’s their peak serving time, the service is not the same as when they have more time. I never had a complaint there yet except for when they quit making those yummy potatoes , so I asked why. Had a bad meal. We tried Ohana for dinner on our first night at Disney World. I have been to multiple Brazilian Steak houses and was excited for this one being at disney. The meats were way overcooked, had to push quite a few pieces of both steak and chicken to the side because they were so burned and dry that I couldn’t cut them with the knife. 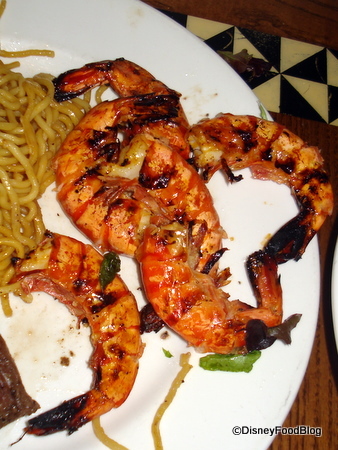 The shrimp wasn’t peeled, which shocked me, because usually grilled shrimp is be peeled prior to grilling. The wontons and wings were the only part I liked. When we got home a week later, I emailed disney with a complaint regarding the food quality, (we had the dining plan) and the Disney customer service rep credited my Credit Card $70+. I was very impressed with that, especially having the dining plan. Atleast they have great customer service. I just went here for the first time two weeks ago with a wedding party for their rehearsal dinner. Major disappointment! We waited for 40 mins with reservations for a table which we eventually had to ask for when they literally forgot about are 22 person reservation. The bread had no hint of pineapple flavor and was much too dry. The wings were a bit tough and no moist as high quality ones are. The steak was definitely hit or miss. Some of it was overcooked and chewy and some were perfect. My favorites were the noodles, vegetables, and salad. Everything else was either horrible or just “ok”. However, I did really love the dessert. Banana’s foster is my favorite and it is hard to get at restaurants. I will never go back to this place from that experience. We haven’t been to WDW since 2011. One more kid later, we’re headed back & this is only dinner we booked so far. I’m looking forward to it even if the meat is over cooked. I’m hoping it’s not as bad this time around. The overall atmosphere is really what we’re looking forward to anyway. Thanks for the blog, too! Just came across this…very helpful. Could I have the meat rare? My family and I have been going to Disney World every year for the past 22 years; each time, O’hana was a MUST! Sadly, like you said, over the years it has been going down hill. They used to serve chips with the 3 dipping sauces, too! And the scalloped potatoes were to DIE for!! How about all the meat options?! There used to be turkey, pork, chicken, sausage, AND steak! They also used to be huge pieces…now they look like meat appetizer bites. In the golden O’hana days they used to be so inviting, warm, and happy to serve you! They would literally keep piling food on our plates to the point we needed to say, “WE ARE DONE!” Now, it seems like they want you in and out in record time…maybe the wait staff is holding a contest amongst each other that we are unaware of….who can get their table out fastest. In August 2015, we had the worst experience there. We arrived and the place was dead; it was at 7…dinner time!! It would have been BUZZING with a crowd in the golden days…now it looked sad and empty. They stuck us at a table near the entrance when the whole place was empty (maybe to make it look like people were there). Our server threw down the salad, dumplings, chicken wings…..then immediately threw down the vegetables and started serving the chicken, steak, and shrimp. She only came to us the first time with the skewers. I had asked for more veggies being that my daughter is a vegetarian….the server seemed angry that she had to go back for something. By time she came back around, empty handed, we just asked for coffee and dessert as we were not going to wait another hour for her to come around with the skewers…we figured we could look forward to dessert….how could they change that right? 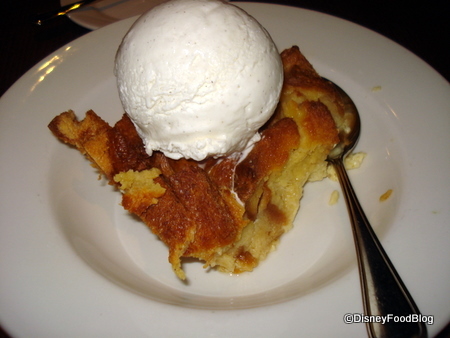 Sadly, it was a sad looking O’hana bread pudding….they gave us a HUGE BOWL of vanilla ice cream on the side….strange. I didn’t pay for 10 scoops of vanilla ice cream…I’d rather a nice bowl of the bread pudding, wouldn’t you? Mind you, there was 3 of us….why the giant bowl of ice cream I will never know….disappointing. We made a decision that night to not return the following year. We always went because we had such nice memories there and it used to be wonderful. I guess for people who go their first time think it is great…..however, real Disney people know the changes!! I’m disappointed that, while it has entertainment aimed at children, it doesn’t offer a children’s menu. These are not really foods my picky eater will eat. She might try the chicken or steak (not the shrimp), but a skewer is hardly a meal. I wish they’d bring the children’s menu back!